Literally, because most of these pieces are way too short to really be of use anymore. But this method totally didn’t work. Especially once I started weaving in the ends. It made it way too thick, plus the color showed through to the other side. So now I’m starting over from scratch. Going to just make tube socks with afterthought heels and duplicate stitching the decoration. Hopefully that makes it all go a bit faster. After all, there are only fifteen days left until Christmas. I had a post all ready to go to tell you about my little sock starters that are only toes. But I obviously can’t post that one because (if you’ve been following along on Twitter) it’s obvious that these are not just toes anymore. this is where I was the next day. 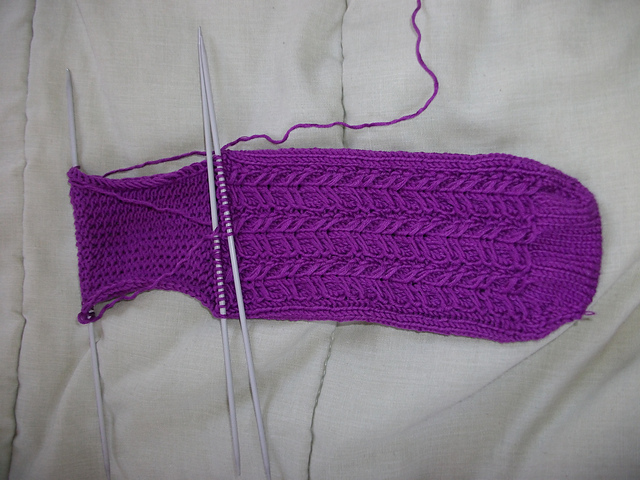 I honestly didn’t know I would get that far, but now I can see why so many people are addicted to the sock knitting. It goes so fast and starts looking like recognizable things very very quickly. See, it was really strange that I wasn’t a sock knitter. 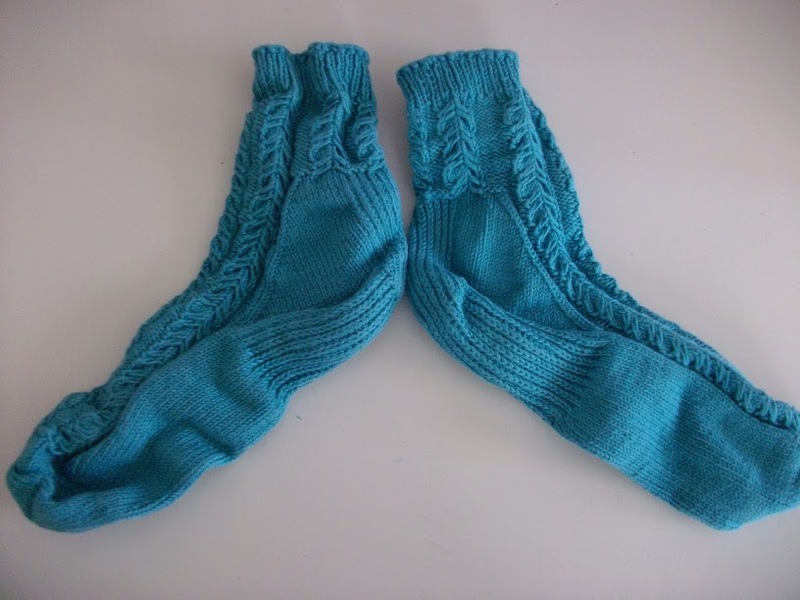 I have an extensive collection of socks, but only one pair I had made myself. And I’ve been knitting for over ten years! Ok, I have knit quite a few socks (you can see some of them here), but they aren’t all for me. Every knitter’s plight, eh? Aside from weaving in the ends (which will probably take me another two months to get around to because…meh), I think these might be done tonight. I’m so close, I can feel it! And for the first time in my life I will have made a pair of socks in October for Socktober. Yippee! Remember way back in June/July when I went to France? Well, in the small town we stayed in for our second week, there was a yarn shop, Au Fil et a Mesure, just a few blocks down from the house. Since I had much more down time there than in Paris (because there aren’t so many places you just HAVE to see in a small town), I decided to pick up some yarn and needles. Sixteen balls of DMC Natura and a set of sock needles, to be exact. I decided my souvenirs would be socks made of French yarn on French needles. I had already picked up some wool to make Cassy’s Zooey hats for my mom and I while I was in Paris, but that project would have been a bit involved to pick up and put down whenever I had a few free moments. So I set about making Cassy’s Earlybirds (btw, Cassy blogs atKnit the Hell Out and designs some amazing things that I just happen to be mildly obsessed with.) for four different people in four different colors. Not all at the same time of course. 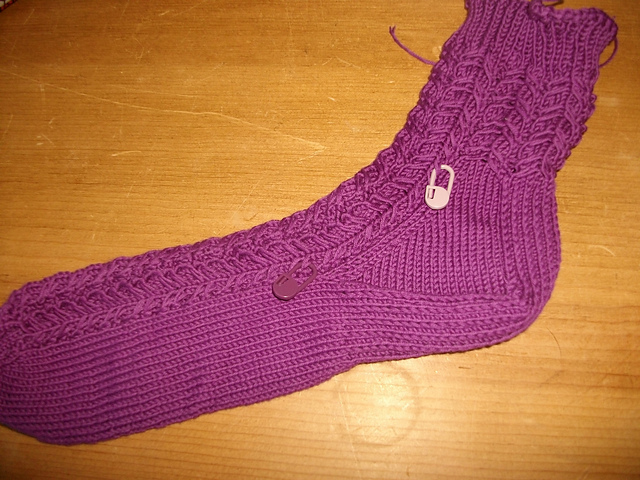 It’s been a long time since I had made socks before I decided to do this. 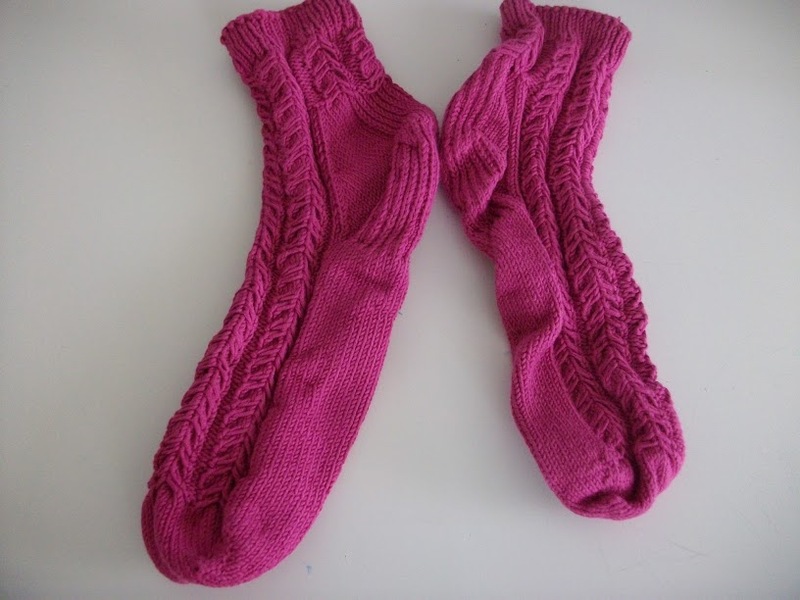 These were also the first time I had made socks in actual sock-weight yarn. Before they were out of some awful acrylic stuff like I was using to make everything at that point because ALL my yarn came from Wal-Mart. Not like there was much of anywhere else to get it where I started knitting anyway. Even the heels are cute in this yarn. The only thing I did majorly different from the pattern is using a cable needle on the cables. I knit pretty tightly and was having a terrible time trying not to pull the stitch out while it was dropped. I still like making gloves better, because they seem to take less time, but I think I may be warming up to sock-making in general. I usually write about my projects once I’ve finished them, but I constantly have many different things going at once. Kind of a creativity ADD, if you will. At the moment I have three different things on the needles, plus a sewing project in the “pile of fabric stage”, and some painting projects in various stages of completion/planning. My carry-along project this week is the same one I was working on at the Hollywood Bowl. I’ve been naming this series of Earlybirds after appropriately colored birds, but I can’t think of a purple bird name. Any ideas? 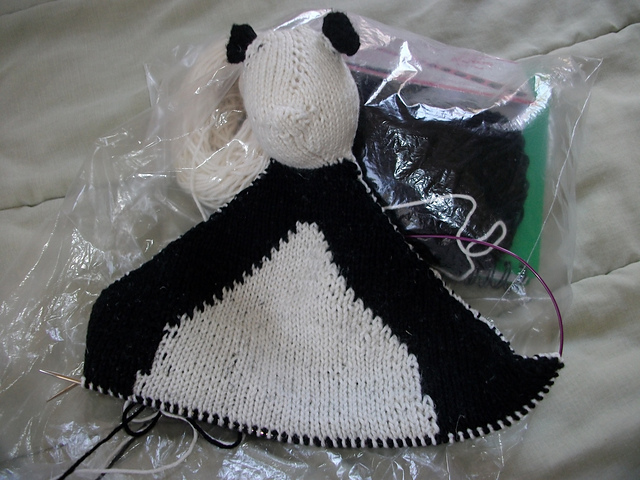 My big project for this month is this little guy, a panda bear lovie for a certain Little Bear’s birthday on Labor Day. I’m just about an inch from the halfway point, where I will be able to start decreasing to make it go faster again. Don’t worry, once I’ve finished the body this little guy is getting black eyes and a nose. Remember how I said I was going to remake these bags from the Hollywood Bowl night? They are currently my fabric pile. 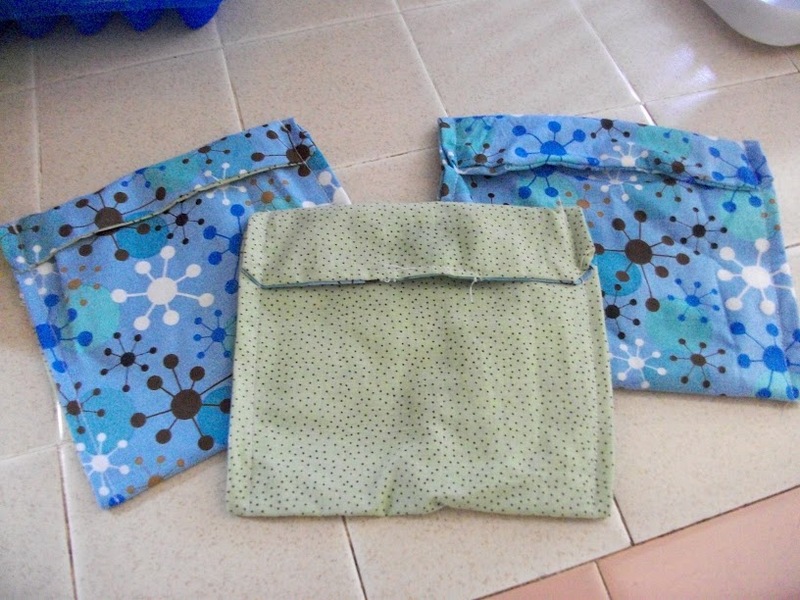 I’m also going to make some snack-sized bags to go along with them. If you want a tutorial to make your own, I got my general idea from this site. 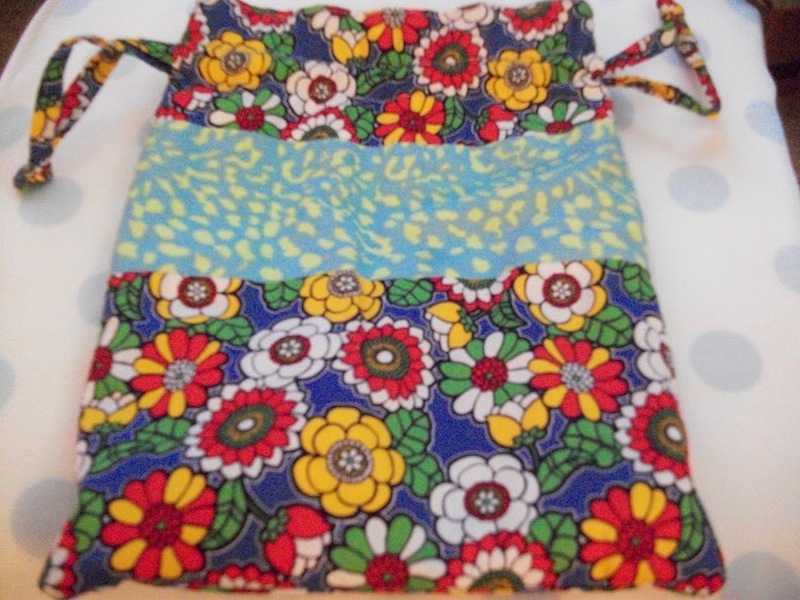 I made my own pattern based on the measurements listed on my plastic bags in the kitchen, though. There are a few other things lying around my room that I am not currently actively working on, but I think this is going to keep me busy at least for this week. I’ve created a long list of projects for myself recently. In order to get everything done in a reasonable amount of time, I’ve started carrying some socks I’m working on with me nearly everywhere. Seriously. I was knitting and walking around downtown Burbank the other day wasting time before I had to go back to work. Anyway, there is no room in my purse to continuously shove the socks, needles, stitch markers, and information card I need to work on the socks at any spare moment. So I needed a way to contain everything and attach it to my bag (or carry it on its own). 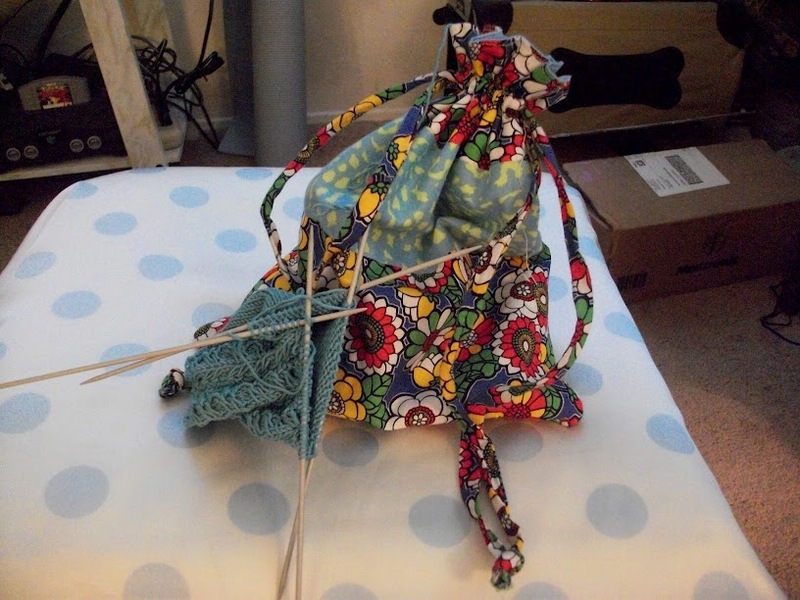 Luckily, I had a free workshop on Craftsy to make a small drawstring bag. I also had the remnants of some “fat quarters” (a half-yard of fabric cut along the fold) lying around. The bag came out just the perfect size for all the things I needed to carry to work on the socks I’m currently making. Plus, the drawstrings let me either tie it to the strap of my big bag or carry it on its own. I even tied it to my belt loop the other day while I was walking. I have a slight obsession with gloves and socks. As in, I own way more of each than I could wear in six months. I also wear gloves way past when it is too warm to do so. These gloves technically combine both of my favorite things. 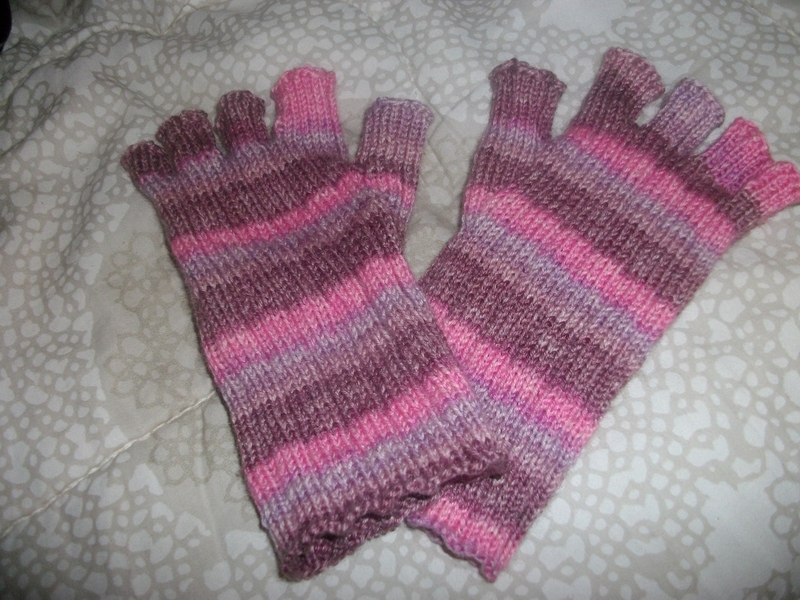 They are knit with sock yarn, making them light enough to continue wearing when it starts getting warm but your hands are too cold. 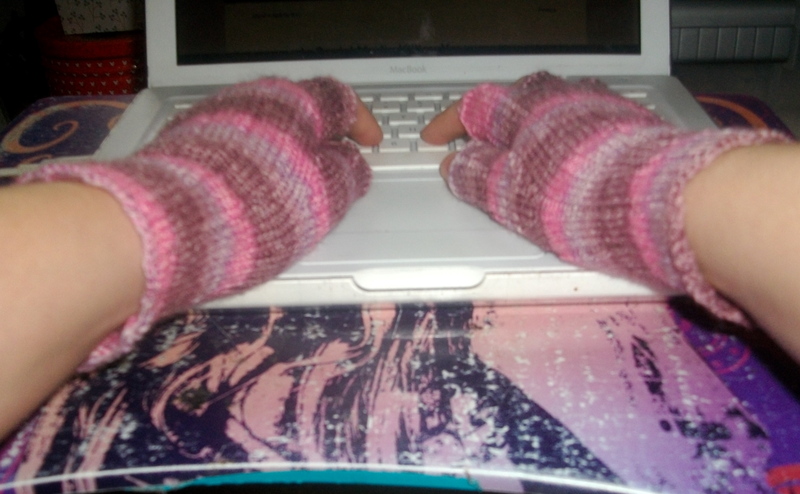 The fingerless style makes them great for working on the computer, knitting, or using your smartphone. Anything that requires the use of your fingers. What is your favorite type of accessory?